In attempting to familiarize myself with weather patterns and cloud movements over China in July I've created a series of animations to visualize it more easily. Cloud photos are courtesy of the Australian Bureau of Meteorology. This page began life as a review and planning tool. It was not originally intended for public consumption. As such the opinions expressed are those of Joe Cali and not the Australian Bureau of meteorology nor the Australian National University, Research School of Earth Sciences. It is however the readers responsibility to review all opinions on the weather and form their own observing strategy and I take no responsibilty for missed opportunities that result from reading opinions expressed on this page. Warning, the animations you are about to open are very large. The total content of the page is more than 15MB! The cost of seeing a solar eclipse is usually prohibitive but the 2009 event is different. Shanghai is a major air hub. Lot's of cheap flights are available particularly with the current recession. Accommodation to suit any budget is readily available in downtown Shanghai. 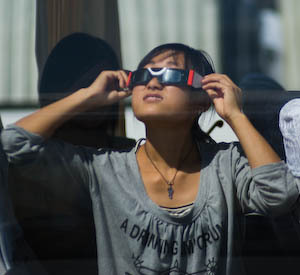 On July 22nd, downtown Shanghai experiences just over five minutes of totality. Spend a little more - grab a taxi and head south just for the morning. The closer you can get to the coast on the river the clearer the air will be. A lot of people are heading to Hangzhou - a tourist city set around a lake to enjoy 5m20s of totality. You can catch a bus to Hangzhou from Shanghai Pudong airport. Hangzhou has a huge number of hotels and apartments. So if the price has put you off in the past. You're never been sure if it's worth the money. Well, here's your chance to get hooked and be poor for ever more. Eclipse 2009: What will you see? If, like me, you lose track of time during totality, maybe this can help. During longer totalities > 3 mins I'll check a clock a couple of times only to find that only 30s or a minute has passed. So I relax then suddenly the diamond ring appears. I've come to the conclusion that the Hubble Constant varies wildly during totality causing the passage of time to feel uneven - or maybe I just get distracted. Apple Macs come with a suite of software included in the price. One of these programs is called Garage band. At first glance, I dismissed it as a piece of junk until I saw a segment on TV about the program annd realized that it had hidden talents. I first used it to compose a handful of salsa songs. I added some narration and put together a salsa rhythm tutorial CD for our dance school (http://www.salsambada.com.au). The advantage of using Garage Band is that music generated using this program can be freely distributed without breaching any copyright provided you don't import copyright material into the program. Garage Band comes with a library of riffs and beats and an array of synthetic instruments you can play yourself using a cheap USB keyboard. We make lots of copies of this CD and give it to our beginner students for free to help them learn rhythm. My latest project is an eclipse-timing track. The track uses an eleven-minute count down to the start of totality followed by a count up during totality. The track starts 11 mins before totality. The diagram illustrates the time signals and announcements. Each place on the time track marked by a number is matched by some sort of announcement and an electronically generated time pip on the track. At -10 mins there is a count in to help you to synchronize the track with real time at your site. If you miss this, fast forward to the 9, 8 or 7min markers. Each minute marker is preceded by two short pips in the preceding 2 seconds.